A Saturday forecast for sunny skies with a high in the low 70s meant that Wendy and I were eager for a hike. We considered various known trails and the drive to get there and back, finally deciding to opt for trails untrodden by either of us near Tahlequah. We first visited the town as a couple in November 2014 and found a couple of trails to hike on nearby Tenkiller Ferry Lake in February 2015. 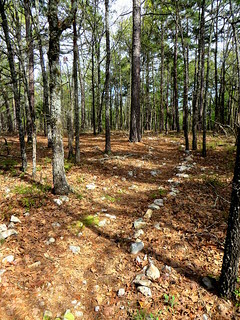 Initially we were thinking of trying for the short and primitive Gum Springs Trail and short Buzzard’s Roost Trail on Lake Tenkiller. But some online research made Sparrow Hawk Mountain a far more promising destination…if we were willing to go hunt or fish. 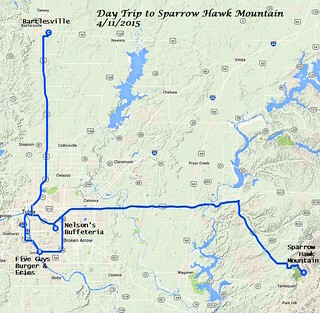 The Sparrow Hawk Mountain trail is in the eponymous Wildlife Management Area. 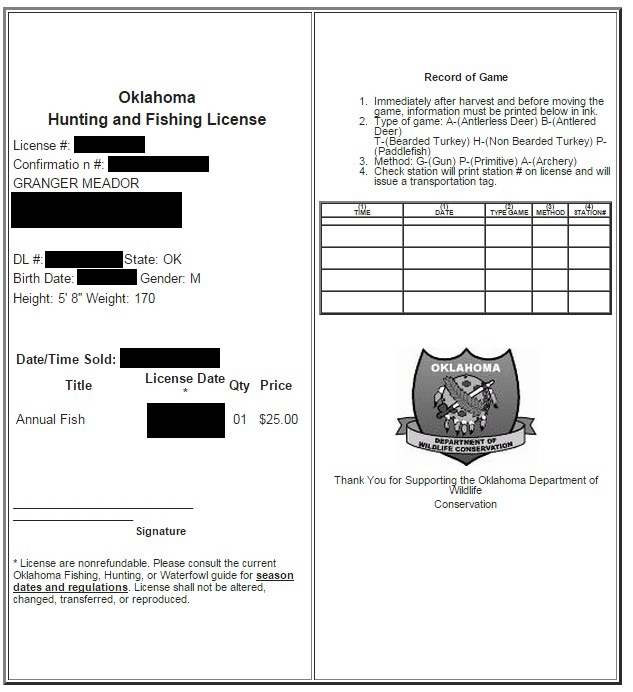 Online and media reports showed that the game wardens were enforcing state regulations requiring one to have a hunting, fishing, or Oklahoma Wildlife Conservation Passport to take this trail, since it is in a hunting area. Several hikers reported receiving $206 fines for ignoring license requirements. At first that put me off since I’m no hunter. But mid April is Spring Turkey season, the Sparrow Hawk area has only low numbers of Rio Grande turkeys, and clearly most of the trail visitors would be day hikers. So I decided to buy licenses for Wendy and me so we could do our part to support the area and hopefully enjoy a good trail. 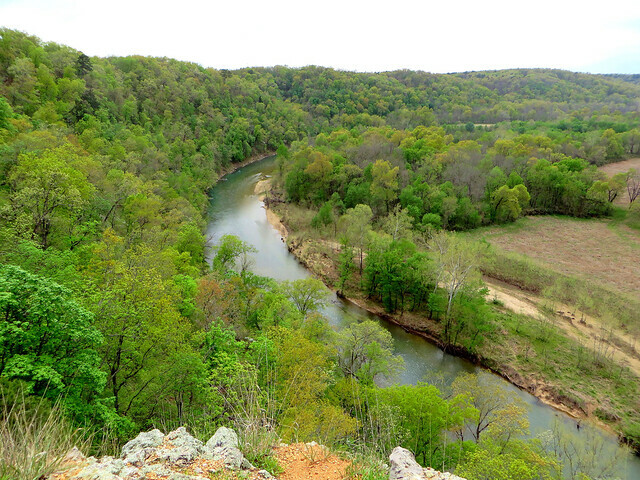 It turned out to be a rewarding investment: we both greatly enjoyed a five mile hike with a beautiful overlook 200 feet above the Illinois River, steep elevation changes, spring wildflowers, and nice mix of pines and other forest trees. I went online to buy a suitable license, discovering that the Wildlife Conservation Passports were $26, which was $1 more than a 2015 general hunting or fishing license, and the latter allow the state to access more federal funds. I have absolutely no interest in hunting for things other than trails and photo opportunities, and I’ve only been fishing a few times. As with sporting events, I’m much more interested in the scenery and fellowship than the game. So I opted to buy each of us a state fishing license, but we’d be fishing for photos. Each of us had to cough up enough information for someone to thoroughly steal our identity, plus we had to pay an additional $3 fee for the “convenience” of printing out our own licenses (what a crock!). We laminated them and stowed them in our hiking packs, to be prepared for any game wardens, and headed south to Tulsa for lunch. 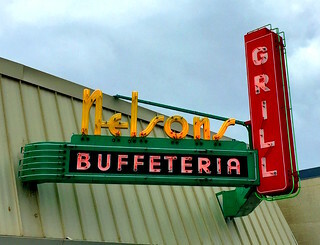 For years I ran across mentions of Nelson’s Buffeteria, a downtown Tulsa icon from 1929 until 2004. Nelson Rogers, Sr. opened the original one in 1929 at 13 West 4th Street, and in 1949 it moved to 514 South Boston Avenue with Suzanne and Nelson Rogers, Jr. in charge. It offered generations of Tulsans traditional Southern comfort food of chicken fried steak or chicken with traditional fixin’s such as mashed potatoes, corn, or green beans, and a roll. When it closed in 2004, I reckoned I’d missed my chance to sample this tradition. So I was surprised to find Nelson’s listed in TripAdvisor’s top 20 Tulsa restaurants in 2015, 11 years after it had closed. Huh? It turns out that Suzanne Rogers and her son Steven, plus now her daughter Jody, re-started the Buffeteria at 4401 South Memorial Drive in January 2013. (Suzanne’s son Nelson Barry Rogers III operated a Nelson’s Ranch House for a couple of years, and later Nelson’s Grill, but both locations have closed.) So Wendy and I pulled up to a strip mall at 44th and Memorial and walked beneath the restored iconic neon sign for a feast. The operation is very old-fashioned. You walk up to a cafeteria counter, tell a server which of the few options you want (chicken fried steak and chicken, pan steak, and drip beef are available, plus a different special each day of the week), pick out a couple of traditional sides, decide whether you want a roll or corn bread, and pick a seat. A waitress comes over and takes your drink order and later asks if you’d like some pie. We both had chicken fried chicken and mashed potatoes, and I added corn while Wendy had goulash. Our chicken was delicious, and the mashed potatoes were heavenly. My green beans were fine, and the rolls were heavy. Sadly, we were both too stuffed on the old-fashioned buffeteria food to sample the pie. It was a good thing we had a hike planned for the afternoon! We then drove 40 miles east on 412 before turning off just south of Locust Grove. The weather forecast was off a bit, with light rain along the drive instead of sunny skies, but we traded water drops for overcast skies along the 25 mile drive southeast through Peggs and Steely Hollow to reach Sparrow Hawk Mountain. 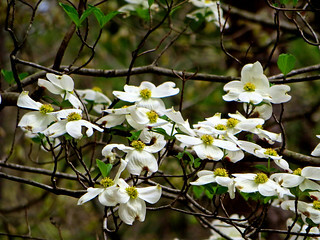 The redbuds and dogwoods were especially beautiful on the drive through Steely Hollow just west of the mountain. The primitive area’s turnoff off Highway 10 is just south of the No Head Hollow access point on the Illinois River which Wendy and I visited last November. Sparrow Hawk Mountain rises over 400 feet above the east side of a horseshoe bend in the Illinois River, just south across the river from Goat’s Bluff or Houston’s Point. 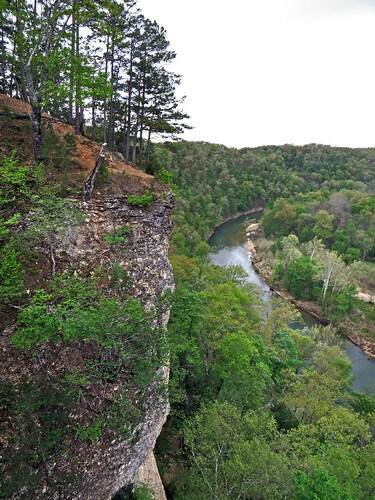 Goat’s Bluff is a rock shelf overhang above the river which was a hideout for outlaws “Pretty Boy” Floyd and George Birdwell for a couple of months in 1932. We found a few cars at the large parking area at the trailhead. There are three trails leading up the mountain. The leftmost one climbs directly up the hillside, the middle one makes a more roundabout climb, and we didn’t follow the third one on this trip. Signs were clearly posted to warn us that we needed a license from the state department of wildlife conservation to proceed. The initial steep ascent climbed 150 feet at about an 18% grade. I had to turn about only partway up, since I realized I’d left my Tilley hat in the car to protect my bald head from the sun and to repel insects whenever I spray it with DEET. Wendy would complain of a bothersome horsefly and other pests later in the hike, and I sprayed her hair and neck with DEET to convince them to leave her alone. It is already the time of year for me to head to K-Mart and pick up some Cutter for our hikes. I much prefer it to the stinkier OFF! repellent. We passed pretty dogwoods and violets on our climb. The trail was very well maintained and fairly wide for a single-track; there were nice signs put up by the Green Country Cyclists Club of Tahlequah. Along with mileage along the main trail, they designated a couple of side trails which are mapped somewhat online. Faded blue trail blazes could be spotted occasionally. About a half mile from the trailhead, it was clear we were about to reach the broad valley of the Illinois River. Wendy didn’t want to be in the shots on this trip, but she did want a shot of me in front of the first valley viewpoint. We passed through a saddle dip in the trail to climb to the popular Lookout Point. We could see the Illinois River both to the south and to the north from this point quite high above the river. A steep descent of about 75 feet led to two lower lookouts 200 feet above the river. I led the way down to the northern one, getting a nice perspective on the tremendous view courtesy of a couple of fellow hikers who had ventured out onto another point farther north. That photo leads off this blog post, while below is the view south. Wendy joined me, and then we made our way up and over to the south lookout, watching turkey vultures wheeling about in the sky as the sun finally broke through the cloud cover. My attempts to photograph the birds were fruitless, but Wendy got a good shot of one above the river. Then we climbed the 36% grade up 75 feet back onto the trail and proceeded north. We passed fallen logs thick with fungi and lichen. 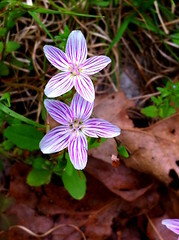 Wendy captured nice shots of a violet and Spring Beauty wildflowers, and we reached a spot along the trail with a profusion of Spring Beauties. 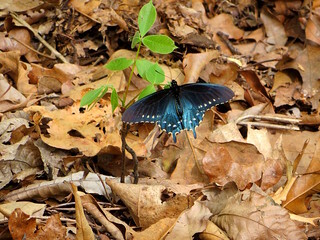 Wendy pointed out a big pretty butterfly posing for me nearby, along with some interesting fungi nibbling away at the base of a tree. We popped out of the woods at Sparrow Hawk Village, a community founded on the mountain top in 1981. The Light of Christ Community Church operated the Sancta Sophia Seminary on the mountain from 1991 until 2012 when the declining number of seminarians led to its closure. The seminary was briefly operated as The Center at Sparrow Hawk Mountain, but it is now closed and for sale. We saw one happy resident who was merrily singing a song as she walked along the road past us, not breaking stride as she chirped a greeting and then resumed her song. There are a number of interconnecting trails south of the village, and I took us down one path which turned out to be a great one mile loop which led down past an intersection of waterways, with occasional nice rock trail curbs and mossy trail segments. The trail had forked once; the one we chose eventually circled us back around to the village. We passed lots with signs and rocks marking private property and found ourselves in a nest of overlapping trails. I know at least one trail is shown online to form a nice southeastward loop, but I had no idea which trail that would be. There are evidently some blue and very faded yellow blazes to offer some limited guidance, but we just bushwhacked back onto the main trail for our return to the trailhead. This fall I’d like to return to hike here and map out a couple of marked side trails. When we reached Lookout Point, I ventured 85 feet down to the northernmost point, where the other hikers had perched earlier. The hillside here was the steepest on the trail, and it was intimidating to see how precarious our perch on the other lookout appeared from this vantage point. This one at least terminated in a flat rock to stand on, rather than a slippery rocky slope. 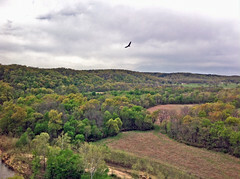 In the photograph of the view northward, Goat’s Bluff is a dark horizontal line amidst the trees in the upper center. We took a side trail at the south end for an alternate route back to the car. We were both tired but happy as we completed our five mile trek, with Wendy noticing her boots had been collecting pollen. She had asked for a hike with hills and flowers, and both were provided. She makes nice pressings of her trail pickings. Our journey back to Tulsa again had light showers. We had a tasty dinner at Five Guys Burger & Fries before returning to Bartlesville. Our fishing trip to a mountaintop yielded a nice catch of photos; we certainly hope to return to Sparrow Hawk Mountain before our licenses expire. Enjoyed reading of your April 11 Saturday. Thanks for including me on your list, and kindest regards. Thanks, Pat! It is fun to share our adventures.